played well by Joseph Gordon-Levitt and some insane stunt doubles) dashing through Manhattan traffic on his fixed gear and brakeless bicycle. So what’s the movie’s hook for bright, intellectual, and environmentally bent Island Press readers? That we should really promote better bike lanes in cities so bike messengers don’t needlessly kill themselves? No, the bike messengers who terrorize innocent civilians, angrily break off cab driver’s mirrors, and flaunt all regard for the law—to the self-righteous exasperation of us life-appreciating bike commuters who dutifully stop at red lights, ride with traffic, signal our turns, and hop off to walk alongside our bikes on sidewalks—are hardly good spokespeople for bike parity. Rather, what struck me most about the flick was that it was about observation, and observation, as Aníbal Pauchard and I argue in our book, is at the heart of how ecology is becoming more relevant and useful to environmentalism than ever before. It’s not just that Premium Rush is an hour and a half of intense observational overload, it’s that it explores the human power of observation as well as any film I’ve seen lately. In particular, there is a repeated set of effects that interrupt the action every so often to show how Wilee’s years of veering through the complexity and unpredictability of people, cars, cabs, delivery trucks, dogs, and dumpsters inhabiting Manhattan’s streets, sidewalks, parks, parking garages, alleys, and (in one scene) bodegas, has given him an adaptable observational sense that saves his hide more than once. 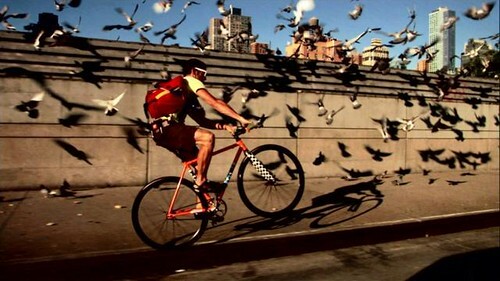 Basically, as Wilee is being hotly pursued by a corrupt cop in a car, or an honest cop on a bike, or alternatively, hotly pursuing a delivery deadline or a competing bike messenger, the chase stops abruptly—usually at a cross street impassably filled with the aforementioned denizens of New York—and the camera closes in on Wilee’s sharp eyes. Then we see, illustrated by a thick curvy yellow arrow overlaid Google-maps-style on screen, the course he is plotting to get through the morass. He starts moving, only to find a hidden truck pulls right out into the path and he smashes face first into it. We go back to him frozen in the intersection and he plots out an alternate route. Now he starts moving again, but this time an unseen mother with a stroller walks off the sidewalk and Wilee takes out the stroller, baby and all. Finally, he plots a third course and takes it “for real”. This time, a sharp move around a hotdog cart and a bunny hop onto the sidewalk gets him safely on his way. What’s the point of all this scenario envisioning, except to reward those of us who shelled out $9 with getting to see Wilee’s body repeatedly battered in all sorts of horrifyingly comical ways? The point is to show that in the split second before he enters the intersection, in that frozen moment before he can even consciously process it, our hero’s subconscious mind has been getting all Bayesian and plotting prior probabilities based on a massive observational database he’s accumulated through passing thousands of similar, but not identical, intersections. And what, then, does all this instantaneous observational processing, calculated while going 30 mph through a concrete and steel landscape, have to do with ecology? I think it’s that ecologists—those that find their way to the science of ecology through the path of good old fashioned natural history—do basically the same thing in tidepools and forests and alpine meadows as Wilee does in the concrete jungle. It’s not nearly at the same pace, and don’t hold your breath for Premium Rush 2: Long-term Monitoring of Shrubs in a Mixed Coniferous-Deciduous Forest, but the process is the same. Good observers of the natural world can make sense of all that impossible complexity by building, through the repeated experience of observing nature, a massive database of the denizens, interactions and pathways that characterize ecological systems. And just as Wilee didn’t need to replicate over and over the exact same experiences to build his observational mind, the field ecologist doesn’t need, nor will ever get, precise observational replicates to begin to make sense of the world. It’s repetition, not replication, that matters. An ecologist well trained in this way can then subconsciously call upon the database to identify patterns and have an innate probabilistic sense of what is likely to happen with a system. This is why we tend to find that the best observers of nature--any nature anywhere--are those who spent a lot of time as kids outside and exploring their world. A student who grew up fishing and collecting amphibians in a Maryland stream will probably make a great California tidepool observer. A biker like Wilee is likely to be a more observant biker in Los Angeles than a native Angeleno. This system isn’t foolproof—big surprises can always obviate all expected outcomes, as Wilee painfully learned in Premium Rush--but it’s as close as we can get to maximizing the adaptability of our minds. And adaptability, as I argue in Learning from the Octopus, is the only way we can deal with the unexpected threats—from climate change, terrorism, or an overturned dumpster in the bike lane—that we face these days. Rafe Sagarin is an assistant research scientist, marine ecologist, and environmental policy analyst, Institute of the Environment, University of Arizona. He is the co-author of Observation and Ecology with Aníbal Pauchard.